Huntington Public Library is proud to announce the acquisition of Digital Sanborn Maps for use within the library. Over 100 years ago, the maps were created for assessing fire insurance liability in urbanized areas across the United States. Today they are a valuable source of historical information. The maps include street names, building numbers with physical descriptions, street widths and more. Their research potential is endless and for genealogists and local historians they can be used to locate ancestor's homes and neighborhoods. HPL's collection includes many urban areas throughout New York State including maps of Huntington in the following years: 1886, 1892, 1897, 1902, 1908, 1914, 1922 and 1930. The map above displays a section of Main St., Wall St. and New York Ave in 1902. Come visit the library and browse this wonderful new resource. 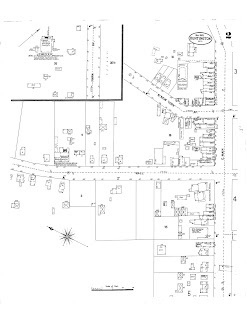 It can be accessed within the library through our homepage, click on Our Databases and scroll down to the link for Sanborn Maps. If you would like instruction on how to use the digital collection, stop by the Mary Talmage Local History Room during the designated hours (listed above), or call (631-427-5165 x261 or 250) or email huntingtonhistory@gmail.com to make an appointment.